15 years ago, the WWE Universe was introduced to Brock Lesnar. An NCAA wrestling champion, and all in all, just a superior athlete with an incredible look. Whenever he has been with WWE he has been a major player, even very early on. During those 15 years, The Beast Incarnate has not simply dedicated his life to pro wrestling. While he's back now and has been for over five years, between the years of 2004 and 2012 Brock tried his hand at a few other things. Those eight years included an extremely successful spell in UFC and also a failed attempt at becoming an NFL player. 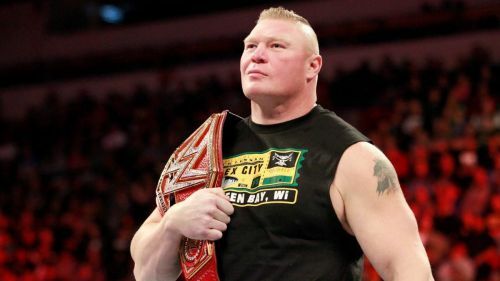 Lesnar fans likely already knew that, but here are ten other insane stories about the Universal Champion that you might not have previously known. There was a class from WWE's now defunct Ohio Vally Wrestling developmental territory that is still discussed to this day despite it being formed in the year 2000. Among others, it was made up of Brock Lesnar, Batista, John Cena, Randy Orton, and Shelton Benjamin. It's incredible to think that all of those Superstars, four of who would go on to become World Champion, broke into the wrestling business and trained together at the same time. It turns out that Lesnar and Benjamin knew each other even before arriving in WWE. 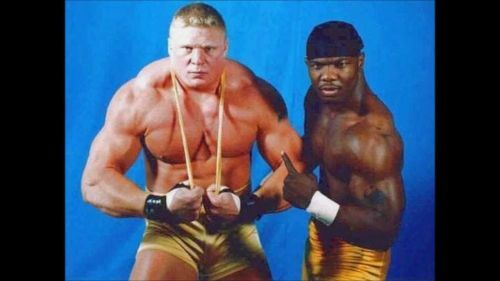 The Beast Incarnate and Shelton Benjamin were actually college roommates. Both established amateur wrestlers, it's no surprise that they would have become friends being at the same college. Not a pair you would necessarily put together today.